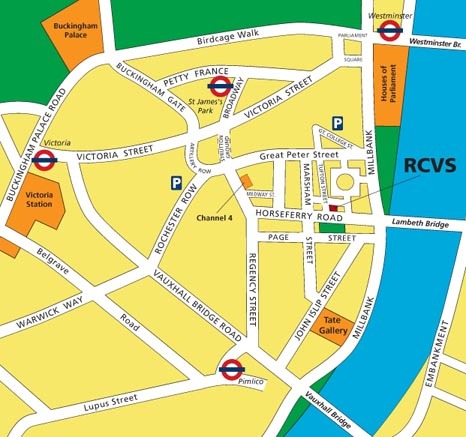 Located in the heart of Westminster, RCVS Knowledge is based at Belgravia House, only minutes away from the Houses of Parliament. Belgravia House is open from 9.15 am to 5.00pm, Monday to Friday and is closed on public holidays. Visitors are welcome to visit the RCVS Knowledge Library, which has print and electronic resources. We also have a members' room with wireless facilities and reading space, where visitors can help themselves to tea and coffee. Wheelchair access is available. If you want to visit please contact us in advance to arrange an appointment and let us know the material you would like to use. It is within easy walking distance (approximately 10 minutes) from St James Park and Westminster tube stations (District/Circle, Jubilee lines) and Pimlico (Victoria line). It is also only a short bus ride (Bus route 507) from both Waterloo and Victoria main line stations. If visiting us by car, please note that the College falls within the congestion charge zone and you will be charged £11.50 to enter central London during the week between 7.00am and 6.00pm. There are two-hour and four-hour parking bays available outside Belgravia House. 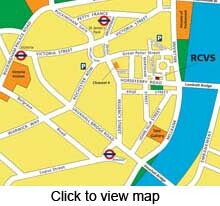 APCOA car park is about 5 min walk from Belgravia House. It is located in Arneway Street, SW1P 2TX. Q-Park Westminster car park is about 10 min. walk, in Great College Street, SW1P 3RX. View where we are on Google Map.